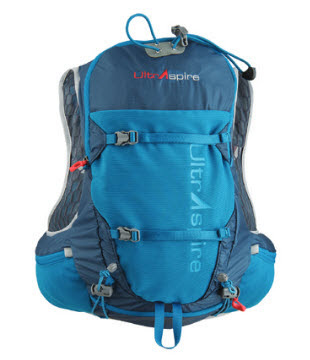 The Ultraspire Zygos 2.0 is a highly versatile hydration vest which easily carries 2+ liters of fluids, food, clothing and other essentials for all day outings. The Zygos 2.0 comes in small, medium and large, so it is important to buy the correct size, as aside from the sternum straps, there are no other sizing adjustments. I am 5'10"/145 with a 38" chest and the medium fits me well. The Zygos 2.0 is reasonably light at 11.5 oz. for my size medium (without the bladder and hose) and is constructed with a nice combination of ripstop nylon, breathable mesh and stretch mesh for stuffing it to the max. 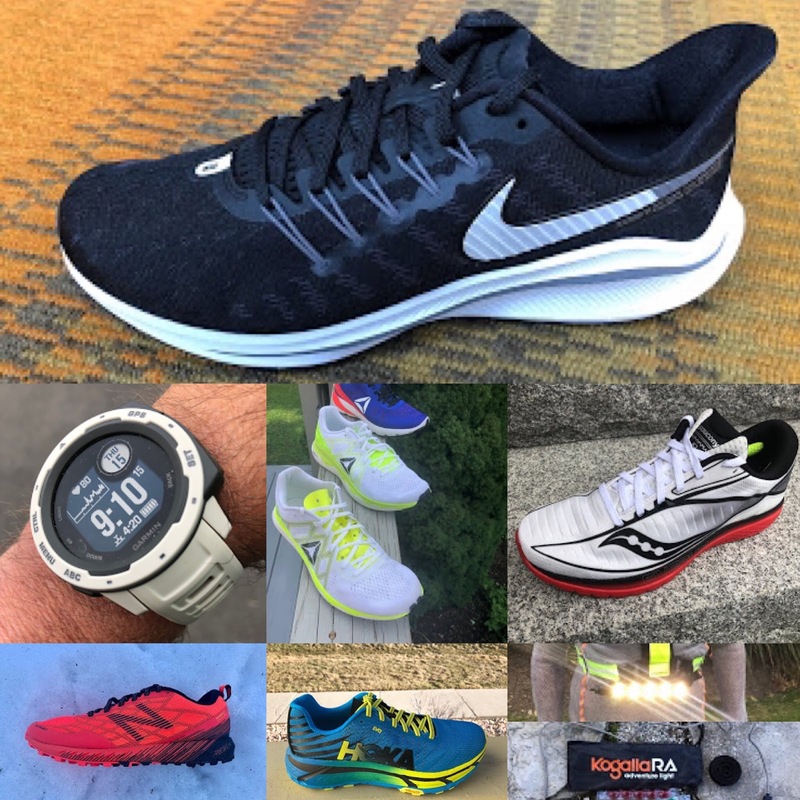 There is plenty of mesh here for breath-ability and comfort. I found the material to stay remarkably dry when I would sweat, at least it does not absorb much due to the large holed, honeycomb style mesh. Even in winter, it would dry quickly as well. The micro fiber polyester edges are soft and non abrasive against skin or clothing. There are a wide variety of pockets for storage and organization throughout the vest, from the front of the shoulder straps, to the voluminous main compartment, to the waist belt. The hose can be moved to various positions on the pack, as it attaches with a magnetic clip system. A nice wide opening for the main storage compartment with another zippered internal pocket just inside to secure infrequently used valuables. There is a single zipper for this main pocket where I would alternatively find it helpful to have a dual zipper. 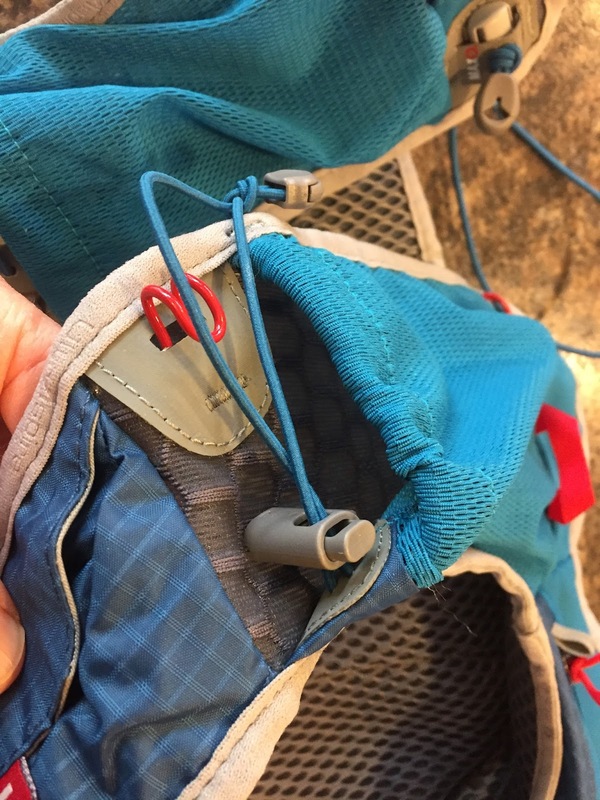 There is a zippered pocket on the upper left shoulder strap that can hold 3 or 4 gels, or any other small valuables. There are large zippered pockets on either side of the waist belt, that can easily fit a smartphone with case, or glove liners, beanie, food, etc.. I can reach them while on the run, but need to rotate the pack around my waist a few degrees to do so more easily. 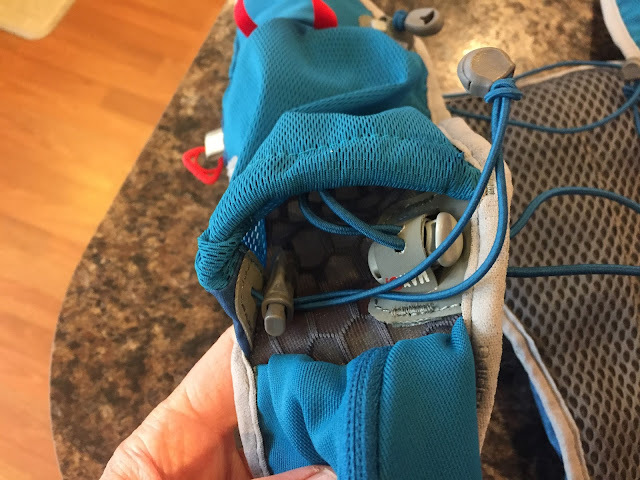 It took me a while to figure out what these small pockets are for, but my best guess would be used gel packets or other trash, as nothing else really fits and the pockets do not secure shut. 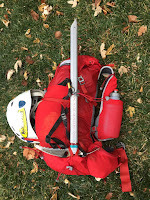 There is a surprise pocket at the bottom of the pack that can stow some extra stuff, as well as bungee straps to hold a pair of folding poles and an ice axe loop. After seeing this photo from the Ultraspire catalog, I attempted to open this pocket while on the run, but was unable to do it without stopping and even then, I was just barely able to stretch enough to pull the tab. I am certain I would lose contents unless I took the pack off, which I found to be easier anyhow. A perfect spot for backup food or other items that you don't need access to often. The lower Max O2 bungee sternum strap adjustment is relatively easy to access, but found that they would not hold snug and a deep breath would expand them all the way out. Even so, this was not a problem, as fit is good enough on my frame that I could breathe deep on climbs and would not get any bounce on descents just leaving them in the fully expanded position. 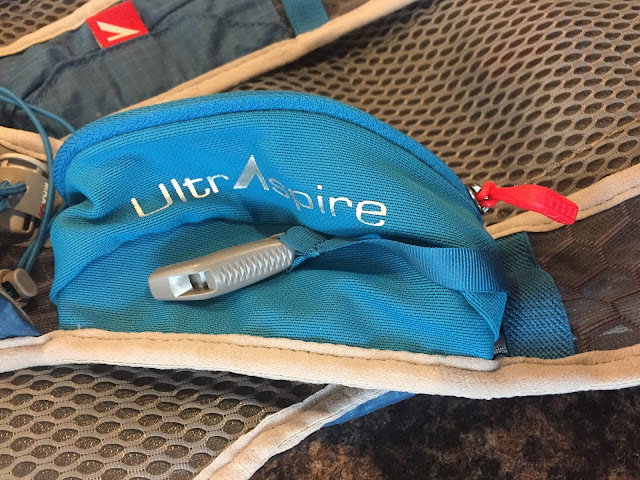 Below is the left chest main pocket, that fits a normal water bottle or soft flask (not included), or could be used for added storage if using the included 2L bladder. I found that with anything in the pocket, either a bottle, or my iPhone, it was nearly impossible to access the Max O2 chest strap adjuster, as well as difficult to access the pocket cinch adjuster. Additionally, the positioning of these tabs makes this area a bit busy and somewhat difficult to get larger items in/out of the left pocket especially. On the right shoulder strap is a waterproof, magnetic pill pouch. It works very well, but I could envision this prime real estate being used for a larger, zippered pocket and moving this magnetic pocket to where the very small trash pockets reside (just a personal preference though). The sleeve for the 2L bladder and anchor. The hose has a small magnet that can be slid into the ideal position for easy access on the vest. The hose clips into the bladder for easy replacement and more convenient cleaning. The slide clip is connected to the bladder, as to not get fumbled off when filling. This refill process takes a little practice however. 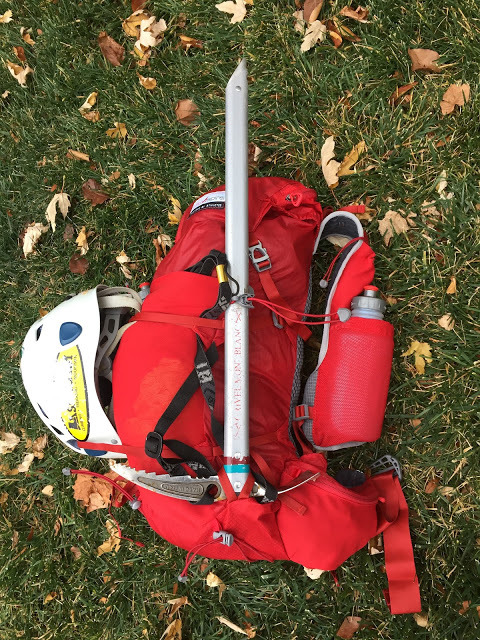 The Zygos 2.0 also carries an ice axe comfortably. Ideal positioning of the hose takes a bit of work and I am still not sure I have found the ideal spot (many options based on personal preference). Two compression straps help secure the main compartment, ideal for varying loads or even strapping extra gear to the outside. 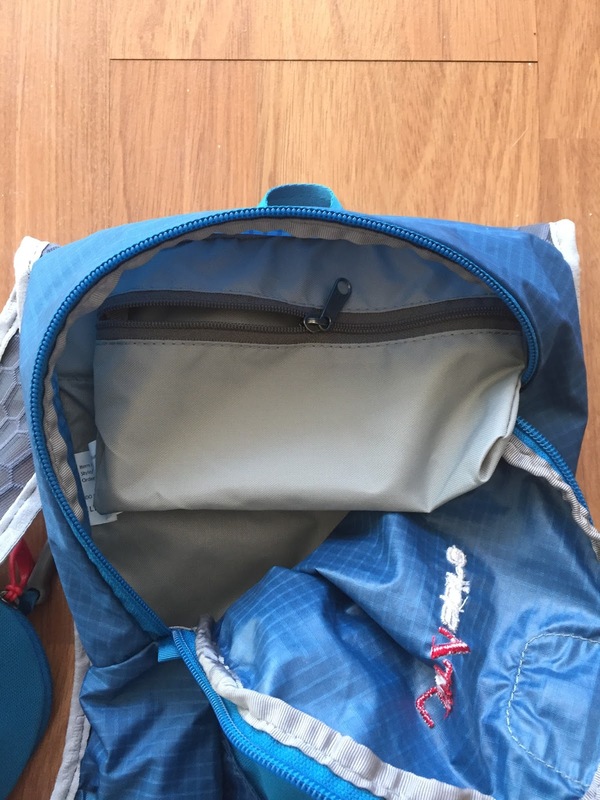 The outermost unzippered stretch mesh pocket is durable and eats up a lot of extra gear, especially handy to store damp items of clothing or a jacket you need to access quickly. 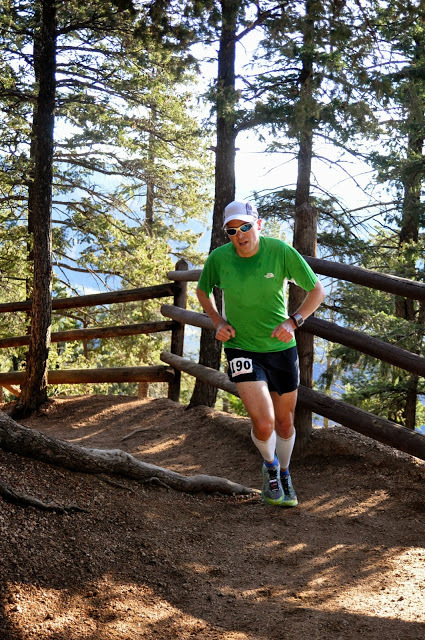 Overall, the Zygos 2.0 is a good running vest for most distances, is high quality, versatile and comfortable. It is light and minimal enough to use for shorter runs where one just wants to carry a phone, a little water and a few essentials, or much longer outings where you would need to add more food, liquids and gear. 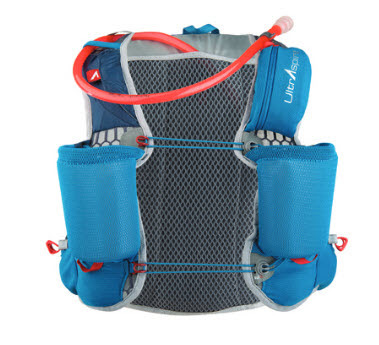 With the potential to carry 3+ Liters of fluids (bladder combined with added bottles to front), you can go quite a distance between fill ups and the Zygos 2.0 carries the weight very well with minimal bounce and a comfortable fit. I do however think that this pack could be improved by re-configuring the chest pockets for greater efficiency and ease of access, as well as re-positioning the adjustment tabs as to not interfere with the bottle pockets. 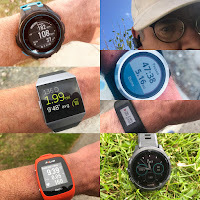 I found it somewhat difficult to make any adjustments and access certain pockets while running, where I would have to really slow down and concentrate, or sometimes stop completely or remove the pack. Not a huge problem, but I have used a few other running vests where I can more easily adjust straps and access pockets without looking or slowing and would love to see the same with the Zygos 2.0. Despite those minor opportunities for improvement, I found the Zygos 2.0 to be a very nice pack and would recommend it. -0.6 for awkward positioning of Max o2 chest strap and bottle pocket adjustment tabs. The Zygos 2.0 was provided at no charge. The opinions herein are entirely the author's.